"What made her so popular? Well, the face, the figure and the blonde tresses were certainly all a plus factor. Check her out in 1932's Red-Headed Woman and you'll see what a difference the color of hair did make. Other Harlow assets: that spunky 'I hear you knockin' but you can't come in' attitude that she flaunted so deliciously. Another reason people adored her then, as new audiences do today, is because she was a brightly gifted actress and comedienne who despite the tough exterior seemed, at heart, a kind, sensible, immensely likeable human being. Costars and friends such as Myrna Loy and Rosalind Russell certainly thought so. They were among those who, three decades after Harlow's death, were so insulted by a salacious book about their longgone friend that each went on numerous television talk shows with fire in her eyes to repudiate the author's words and defend Harlow's reputation. It takes an extraordinary person to inspire that kind of devotion." Today is the final day of the Jean Harlow Blogathon, hosted by The Kitty Packard Pictorial. It has been both educational and oh! so much fun going through all of those blog entries about Jean this past week. 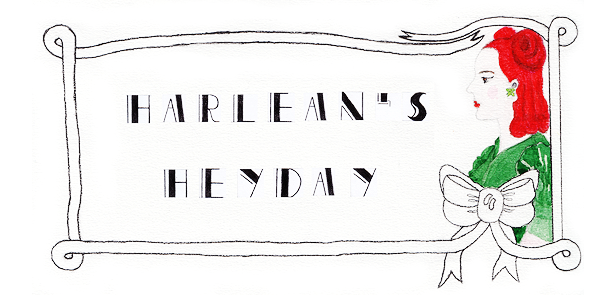 And there's still more to come so keep your eyes peeled on Carley's amazing blog! Thank you to all of those who have played along here at Harlean's and left such lovely comments. As always, I appreciate each one of your input! Also, don't forget to pick up Harlow in Hollywood: The Blonde Bombshell in the Glamour Capital, 1928-1937, written by Darrell Rooney and Mark A. Vieira. I went around London looking for my copy a couple of days back and was, unfortunately, left empty handed; apparently the book doesn't release in the UK until July! I'd really love to hear thoughts from any of you who were able to pick up the book this week. Please don't hesitate to leave a comment if you've been able to go through this fantastic gem already. Today I wanted to highlight some very exciting Harlow related happenings. 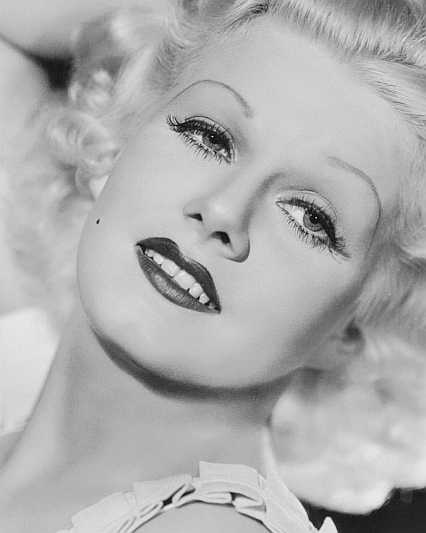 Firstly, as some of you may have heard, the Hollywood Museum, located in the Max Factor Building, is hosting the new Jean Harlow Exhibit. It is guest curated by Darrell Rooney and runs from now through September 5, 2011. The exhibit features Jean's personal and studio related items, such as letters, contracts, autographs, photos, posters and costumes, as well as the infamous Paul Bern/Jean Harlow Mural that once hung in the couple's home. Sadly it seems like I won't be able to visit Los Angeles during the time of the exhibit but I really hope some of you are able to check it out - and, of course, report back with your thoughts! Also, TCM has named Jean its Star of the Month for March 2011 to celebrate her Baby's Birthday! This means that TCM will show 20 of our Baby's movies each Tuesday night this month, starting next week. What a wonderful treat, especially considering the fact that many of these are still not available on DVD! Read on for the schedule of Harlow films. oh I am so frustrated our cable provider doesn't offer TCM!!!! Great little video segment, though. Thanks for sharing! BaronessVonVintage - I hear ya! It would such a dream to have TCM, wouldn't it! Thanks for sharing that she will be star of the month on TCM: I wasn't aware of that even though I watch it quite a lot. Also: I agree with your comment about the hair. She was very pretty as a red-head, but it was the platinum that really gave her character! Liana - No problem, glad to have helped with that! I hope you manage to catch some of the Jean films this month. While I love Harlow as a platinum blonde and it definitely did give her the look and character we most associate with her, I think I personally prefer the look she sported in the last few years of her life with the 'brownette' hairdo. Annnnd I did love the red wig on her too! It is such a good wig and looked very natural (unlike in most movies these days).